"Human fellowship and sturdy joy come to us as we create and keep on recreating our fragile relationships, making them last through the power of caring love. To dare to make and care to keep commitments — this is to live." Caregivers look after the daily needs of others, spending an average of 20 hours per week. According to the report "Caregiving in the U.S." by The National Alliance for Caregiving (NAC) and the AARP Public Policy Institute, an estimated 43.5 million adults in the United States have provided unpaid care to an adult or a child in the prior 12 months. About 18.2% of the respondents surveyed reported being caregivers. The estimated prevalence of caring for an adult is 16.6%, or 39.8 million Americans. Approximately 34.2 million Americans have provided unpaid care to an adult age 50 or older in the prior 12 months. Care includes not only help with feeding, transporting, and providing medical assistance; this kind of loving service also means dealing with the fears, regrets, hopes, and other feelings of those in their care. Diane is a deeply spiritual film about such a caregiver, and we welcome the opportunity to experience a slice of this life. The film stands apart from the plethora of action dramas, superheroes, dramedies, thrillers, murder mysteries, or horror stories that populate the big screen these days. 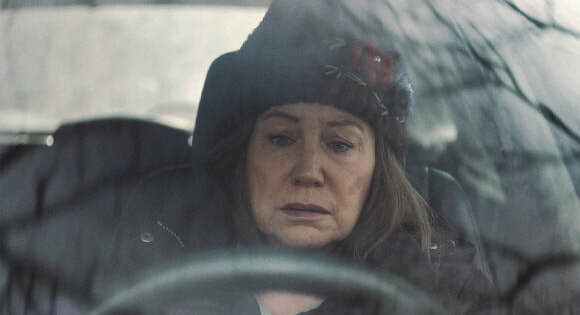 Baby boomer Diane (Mary Kay Place) is a widow who lives in rural Massachusetts. At the local hospital, she comforts her cousin Donna (Deirdre O'Connell) who is dying of cervical cancer. She stops in to bring groceries and casseroles to neighbors recovering from a variety of ailments, and she visits often with her aunt Aunt Ina (Phyllis Somerville), a rebel smoke while wasting away from emphysema. At gatherings with family and friends, including her mother (Estelle Parsons), Diane trades concerns about those in her carescape. This selfless service of others depletes the waning supplies of her energy and demands large doses of patience and magnanimity but for a while, she seems up to the challenges. Luckily, she has a good friend (Andrea Martin) with whom she can share her complaints and have a few laughs. The biggest drain on her caregiving capacities is her son Brian (Jake Lacy), a thirtysomething whose drug addiction has gotten the best of him. Diane does his laundry and urges him to clean up his apartment. She drops by regularly to bring him food. He gets upset with her nagging him to return to his rehab program, but when he does, she is shocked when he and girlfriend get caught up in Christian fundamentalism. They invite her to dinner and tell her she needs to be born again. Diane explains that she is fine with her own church and demands that they leave her alone. Weighing heavily on several of her relationships is Diane's feelings of shame for a grievous past sin that she just can't shake off. That's why a moment at the soup kitchen where she regularly serves food to the homeless feels so meaningful. An old man speaks from his heart and tells her, "When you serve me, I feel sanctified." Seeking care for herself, she visits an old haunt and dances to the jukebox. Later, at home, she begins writing in her journal about the blessings that keep creeping into her days in small sights and sounds. It is helpful and healing to experience a spiritual movie like Diane. Again and again the caregivers amongst us reach out to those who are sick, hungry, lonely, or dying, even when they themselves are in pain. People want to be of service; they yearn to give of their time and talent to do what must be done. They prove that caring for those in need is how we manifest love.